Gallia Academy senior quarterback Justin McClelland (7) breaks away from a tackle during the first half of an Aug. 24 football contest against Meigs at Memorial Field in Gallipolis, Ohio. 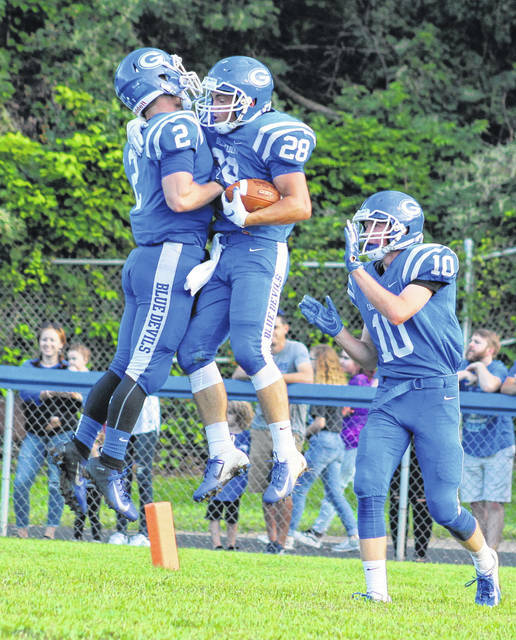 Gallia Academy senior Lane Pullins (28) celebrates a touchdown with teammates Ben Cox (2) and Cory Call (10) during the first half of a Sept. 1 football contest against River Valley at Memorial Field in Gallipolis, Ohio. 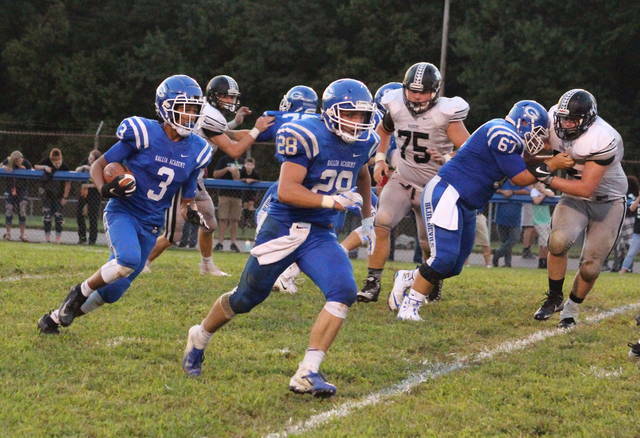 GALLIPOLIS, Ohio — After another six-year hiatus, the Blue Devils are back in the postseason. In its first postseason game since 2012 and second since 2006, the second-seeded Gallia Academy football team will battle seventh-seeded Licking Valley in the opening round of the Division IV, Region 15 playoffs on Saturday at Jackson High School, with kickoff scheduled for 7 p.m. The Blue Devils are 6-11 all-time postseason games, with five of the victories coming in the opening round. In 2012, GAHS defeated Cincinnati Archbishop McNicholas by a 37-35 in Gallipolis, before falling to eventual state semifinalist Thurgood Marshall. Second-year Gallia Academy head coach Alex Penrod — who led Alexander to the playoffs in 2015, his second year as Spartans’ skipper — is glad that his 10 seniors will get to take in all that comes with the postseason. 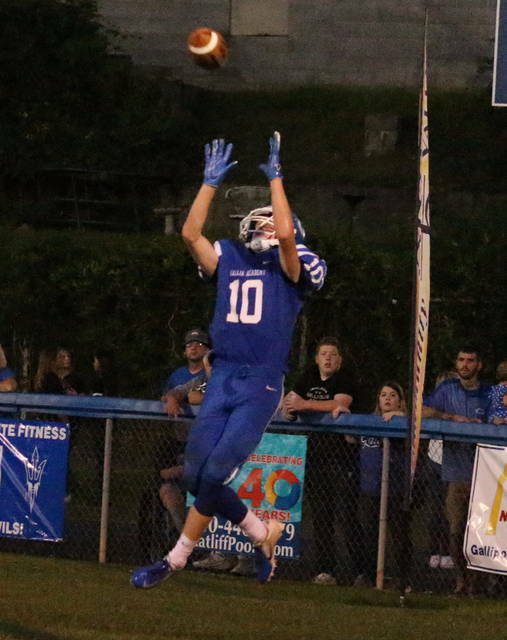 Gallia Academy enters the postseason with a seven-game winning streak, making their final regular season record 9-1, the program’s best regular season mark since 2003. GAHS earned the program’s 18th league title, its first in the Ohio Valley Conference, as the Blue and White were unbeaten in the eight-team league. Gallia Academy is one of four playoff teams from the OVC, as Ironton, Portsmouth and Fairland also qualified. Penrod noted that while some teams are satisfied with regular season success, the Blue Devils don’t fit that mold. This season, GAHS senior quarterback Justin McClelland completed 83-of-136 pass attempts, earning 1,158 yards and 10 touchdowns, against just three interceptions. McClelland also has 717 yards on 119 carries, with eight rushing scores. Along with McClelland, two other Blue Devils have over 100 carries this fall, with Lane Pullins earning 792 yards and 12 touchdowns on 133 totes, and Jacob Campbell posting 630 yards and 18 touchdowns on 105 tries. Neither Campbell or Pullins has fumbled this season. GAHS sophomore James Armstrong has 792 offensive yards, combining 29 receptions and 38 carries. Armstrong has found the end zone five times on carries, four times on receptions, once on a kickoff return and once on a punt return. Senior Cory Call is second on the team in receptions and receiving yards, with 24 grabs for 345 yards and four touchdowns. On defense, a trio of linebackers lead the Blue and White, with Campbell earning a team-best 82 tackles, Cade Roberts adding 72 and Trentin Waller earning 68. 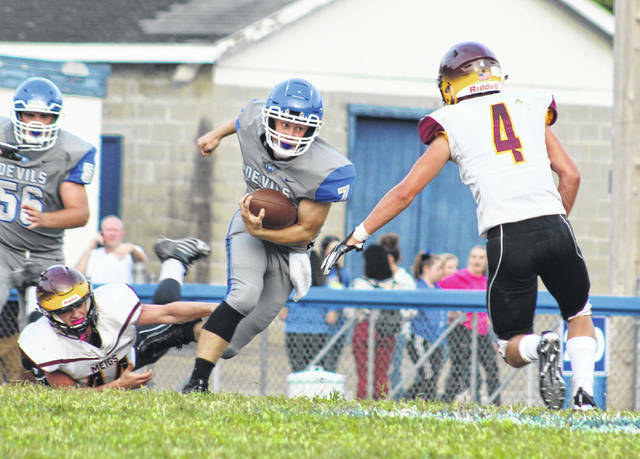 This season, Gallia Academy’s defense forced 18 turnovers, and recorded a pair of safeties. Through 10 weeks, GAHS has a 199-to-119 advantage in first downs, a 3,889-to-2,480 advantage in total offense, and a 58-to-29 edge in touchdowns. The Blue and White have made sure to start on the right foot all season long, outscoring teams by a combined 107-to-27 in the first quarter. GAHS has a 109-to-72 advantage in second quarter scoring, and a 97-to-50 edge in the third quarter, while outscoring foes by a 90-to-36 clip in the fourth. Blue Devils placekicker Andrew Toler is 18-of-24 on extra point kicks this fall, while making one 29-yard field goal. GAHS is 18-of-33 when trying for the two-point conversion this fall. The Blue Devils set a new program record for points in a season, scoring 40.9 points per game, including a 44.4 points per victory. Gallia Academy’s defense pitched a pair of shut outs this fall, the first time since 2007 that GAHS has shut out multiple teams in a year. McClelland is in his third campaign at starting quarterback for the Blue Devils, and talked about the development of the team from his first year under center, when the Blue and White finished 1-9 for a second straight season. McClelland believes in the game plan his coaches have provided, and hopes the Blue Devils follow through on the field on Saturday. Coach Penrod isn’t the only Blue Devil with postseason experience, as Jacob Campbell was a freshman on River Valley’s 2015 playoff squad. Campbell noted the differences as a much more integral part to this playoff team. While GAHS is the home team, field conditions forced the Blue Devils to move the game to the site of their only regular season setback, Alumni Stadium in Jackson, where the Ironmen held on for a 15-9 victory in Week 3. Penrod noted the extra motivation to redeem that loss. GAHS was the first-ever road team to win in Alumni Stadium and the Blue and White last tasted victory in the Apple City in 2004, defeating the Ironmen 14-13 in Week 7. Licking Valley’s only three losses this season came to teams that finished 9-1. Sheridan defeated LVHS 36-21 to open the season, then Johnstown-Monroe edged out a 10-9 victory two weeks later. After five straight wins against sub-.500 teams, the Panthers suffered their largest setback of the year by a 38-14 count to visiting Granville in Week 9. Licking Valley’s only triumph against a winning team came in Week 10, as the Panthers defeated Licking Heights (6-4) by a 36-7 tally. This is the 18th trip to the postseason for the Panthers, including their second straight. LVHS has made the playoffs five times in the last six seasons, and 14 times since 2000. Licking Valley is 27-17 all-time in the postseason, with state runner-up finishes in 2001 and 2007. Licking Valley is led by 43rd-year head coach Randy Baughman, an inductee into the Ohio High School Coaches Hall of Fame, and the man the Panthers named their stadium after. Licking Valley’s run game is paced by a pair of seniors, tailback Connor McLaughlin and quarterback Chase Whisner. McLaughlin has 1,157 yards, while Whisner has 932, with both players running for 15 touchdowns. Whisner has completed 75-of-117 pass attempts for 1,042 yards with eight touchdowns and four interceptions in his first year as starting signal caller. The Panther lines are anchored around Iowa State commit Jarrod Hufford, a 2017 All-Ohioan. LVHS junior Mitchell Ford has 692 total yards, with a pair of rushing touchdowns and two scoring catches. Senior Ethan Hile leads the Panther receiving unit with 38 grabs for 325 yards and four touchdowns. The LVHS defense has returned four interceptions for touchdowns this fall. Ethan Hile leads the team with a quartet of picks, while linebacker Colin Kozlowski has a team-best 66 tackles this season. Dave Weidig of the Newark Advocate contributed to this report.